The app cannot determine my location (red satellite symbol). How do I adjust my location services (GPS-position)? 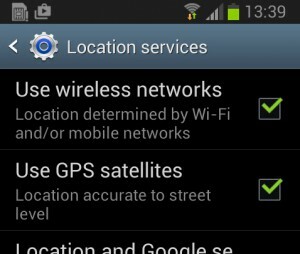 Up until Android 4.4: Go to Smartphone-settings >”Location” or ”Location services” and allow your smartphone to determine your position via “GPS satellites” and “Wireless networks”. 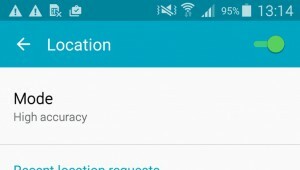 From Android 5.0 onwards: First, go to your Smartphone-settings and activate the location services (green button at the top). Second, increase the GPS accuracy by adjusting the location “mode” – please select “High accuracy”. iOS: Go to your iPhone-settings > Privacy > Location services and make sure that they are activated (green button). Below, you’ll find a list of all installed apps that use the GPS-receiver. Here, the access to the GPS receiver should as well be granted to Blitzer.de/CamSam (PRO) for the app to be able to determine your GPS position and to work properly. Android and iOS: For these new settings to be saved and realized correctly you’ll need to turn the smartphone off and on again. Subsequently test the app outside.Where is the smartphone positioned in your car? 3) Please insert the battery again and start the smartphone, WITHOUT the SIM card. 4) Now check if the GPS App can locate your current position and determine the number of visible satellites. You’re welcome to send us screenshots of the app to info@blitzer.de. Generally you should be aware of the fact that CamSam/Blitzer.de needs a very good quality of the GPS signal (because we want to give you as accurate speedcam positions as possible). Only when a certain quality level of this signal, the app informs you of having found a GPS signal. For other (navigational) apps a lower quality level might suffice. A comparison between apps might, thus, not necessarily be meaningful.